The Watertown officers, testifying Monday in the federal death penalty trial of Dzhokhar Tsarnaev, described a ferocious gun battle that began early on April 19, 2013, after an officer spotted a carjacked Mercedes SUV on a quiet residential street. During the ensuing shootout, officers said, Dzhokhar Tsarnaev and his brother, Tamerlan, hurled explosives at police, including two pipe bombs and one pressure-cooker bomb similar to the bombs used near the marathon finish line that killed 3 people and injured more than 260 others. Joseph Reynolds, the first officer there, said he "locked eyes" with the driver of the stolen SUV, a man later identified as Tamerlan Tsarnaev. Reynolds said Tamerlan Tsarnaev got out of the car and began firing at him. "All I could see was muzzle flashes," he said. "I couldn't count it. It was nonstop." The shots continued as other officers began to arrive, Reynolds said. He saw a wick and a lighter and then watched as an object flew through the air, landed in the street and exploded, he said, shaking him to his knees. "I could feel all the debris landing on top of me," he said. Sgt. Jeffrey Pugliese said he cut through backyards to get closer to the bombers and eventually could see their feet illuminated by car headlights. He said he aimed at the ground near their feet to have the bullets ricochet into their ankles. While he was doing that, Tamerlan saw him and came charging up the street firing at him, said Pugliese, who fired back. The two men came face to face, with only 6 to 8 feet separating them, Pugliese said. But Tamerlan had a problem with his pistol, the officer said. "He kind of looked at his gun. He looked at me. We looked at each other," Pugliese said. "I think out of frustration, he threw his gun at me." Pugliese said Tamerlan began to run away, but he tackled him. Tamerlan continued to struggle as three officers tried to handcuff him, even though he was wounded and bleeding, Pugliese said. Jurors walked around the boat, taking notes, and then went two at a time onto a lift so they could look inside the vessel, which was on a trailer. That's when they saw the stolen car speeding toward them with Dzhokhar behind the wheel, Pugliese said. The officer stepped out of the witness box to demonstrate how he tried to pull Tamerlan out of the way and rolled over to get out of the car's path himself. "The black SUV, it was right in my face," he said. "I looked down, and I saw the front wheels were over Tamerlan." Jurors in the trial of Boston Marathon bomber Dzhokhar Tsarnaev have been shown a dramatic video of a carjacking victim escaping from Tsarnaev and his brother days after the attacks. Dzhokhar ran over his brother and dragged his body 25 to 30 feet, Pugliese said. He also struck a police car before he made his escape. 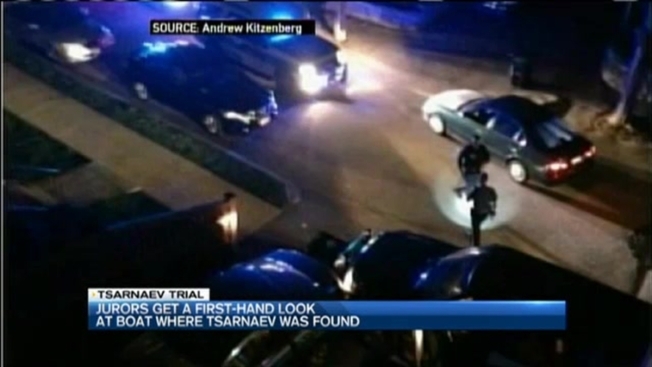 After a massive manhunt and door-to-door search, Dzokhar was found hiding in a boat parked in a backyard in Watertown. Earlier Monday, jurors went to see the bullet-ridden boat, which was brought to a location in South Boston. The Associated Press was one of two news organizations and three courtroom sketch artists allowed to see the boat and provide pool coverage for the media. Eccentric Heir Robert Durst: "I Killed Them All"
The 18 jurors walked around the outside of the boat and peered inside, while Tsarnaev, flanked by three attorneys and U.S. marshals, watched impassively from a table about 50 feet away. As a defendant, Tsarnaev had a right to be present at the viewing. The red and white boat is covered with more than 100 bullet holes marked individually with small pieces of white evidence tape. One of the boat's two front widows is shot out almost completely. Jurors took notes and then went two at a time onto a lift to look inside the vessel, which was on a trailer parked on a flatbed. Jurors in the trial of Boston Marathon bombing suspect Dzhokhar Tsarnaev on Monday visited the bullet-riddled boat in which he was captured days after the deadly blast in this sketch. Inside the boat, called the Slipaway II, they could see the note Tsarnaev wrote denouncing the U.S. for its wars in Muslim countries. The note, written in pencil, is speckled with at least 10 bullet holes and stained with long streaks of blood, though the writing was barely visible and the blood stains had faded considerably from how they appeared in photographs shown to the jury last week. Prosecutors said another portion of the note was carved by Tsarnaev into wood slats on the boat, which were not visible Monday but are expected to be shown to the jury later. The judge ruled that the location of the boat could not be revealed to ensure the security of jurors and the defendant. 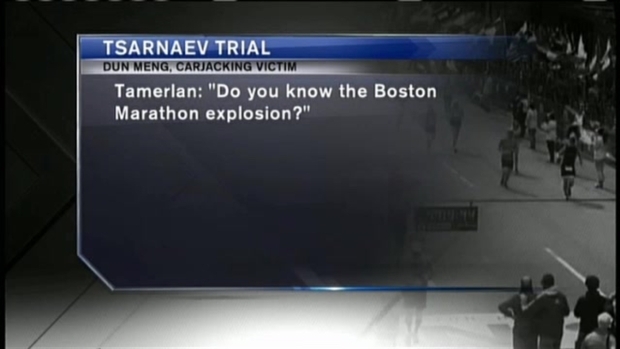 Tsarnaev's lawyer admitted during opening statements that he participated in the bombings and the later crimes but said Tamerlan was the mastermind who recruited the then 19-year-old Dzhokhar to help him. The same jury that decides guilt will decide whether he receives life in prison or the death penalty.